By Mike Smith: Adrien Broner is heading for trouble in his fight against Manny Pacquiao on January 19, according to trainer Freddie Roach. He says Broner could get stopped in the early rounds if Pacquiao (60-7-2, 39 KOs) backs him up against the ropes, and shells him to pieces. 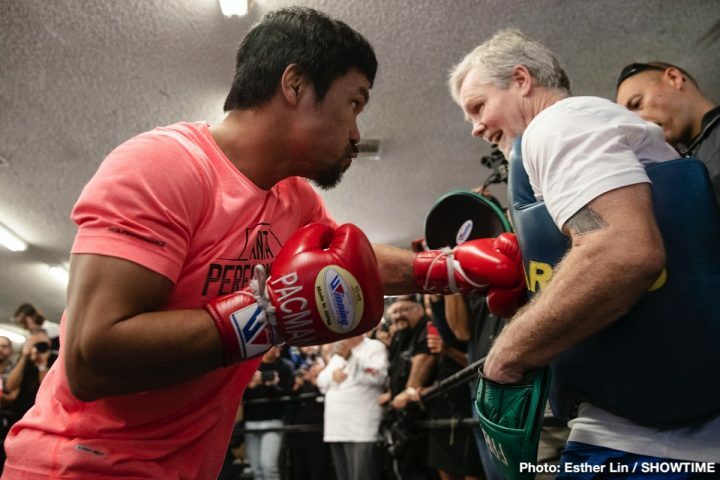 Roach says that Broner’s low punch rate, and his habit of covering up when he’s under attack is going to put him at the mercy of WBA World welterweight champion Pacquiao in their fight on SHOWTIME PPV at the MGM Grand in Las Vegas, Nevada. What Broner has going for him is he’s a counter puncher with a good chin, and he’s going to be looking to catch Pacquiao with big shots every chance he can get. Broner’s jab is a good as well, and he could upset Pacquiao’s timing of his attacks if he jabs him hard as he’s going on the attack. That’s what Floyd Mayweather Jr. did to nullify Pacquiao’s offense in their Fight of the Century in 2015. Mayweather caught Pacquiao with some hard jabs and well timed right hands in the first four rounds of the contest. The large crowd got into it, and that seemed to throw Pacquiao off his game for the remainder of the fight. Mayweather was able to do that because of his hand speed and great timing. Broner isn’t as fast as Mayweather, and he lacks his timing. Years ago, Errol Spence knocked out Broner at the Olympic training facility during a sparring session, says Roach. He says Broner and Spence were both wearing headgear and large gloves, and it still ended badly for Adrien. Roach feels that if Spence was able to KO Broner with while the two of them were wearing the larger glove and headgear, then he must not be that good of a fighter. What Roach doesn’t say is Spence is a pretty special fighter with size and a lot of punching power. Spence is a natural welterweight, who could be fighting at at 154 if he wanted to, and would likely do well in that weight class. At this point in Pacquiao’s career, he’s more of a natural light welterweight, so there’s a size difference between him and Spence. What Spence did against Broner might not necessarily be possible for the 5’6 1/2″ Broner. Roach says that Broner’s main problem is he still thinks he’s Floyd Mayweather Jr., and he’s wasted his career by trying to imitate him inside the ring. Broner would have been better off being the fighter he is, according to Roach. Broner has been fighting like Mayweather since he first turned pro in 2008, and he’s found success doing that. It wasn’t until Broner moved up to 140 and 147 that he started to have problems against the fighters his own size, who possessed more talent than him. Pacquiao wants to knockout Broner, says Roach. Pacquiao hasn’t wanted to knockout his opponents for a long time. Roach has been predicting knockout wins for Pacquiao for the last ten years of his career, but the last time he stopped someone while Roach was still his trainer was in his 2009 fight against Miguel Cotto. in 2009. Pacquiao was trained by Buboy Fernandez in his last fight against former WBA World welterweight champion Lucas Matthysse on July 15 in Malaysia. Roach can’t take credit for Pacquiao’s last knockout, because that was not him in his corner. The last time Roach was with Pacquiao during one of his knockout wins was way back in 2009. That’s a long time to go in between knockouts, and you have to wonder what Roach was doing wrong, considering that Pacquiao fought a lot of guys that he should have been able to knockout, but didn’t. These are the fighters that went the distance with Pacquiao in his last 10 years with Roach as his trainer: Joshua Clottey, Juan Manuel Marquez, Shane Mosley, Brandon Rios, Antonio Margarito, Chris Algieri, Jessie Vargas, Floyd Mayweather Jr., Jeff Horn, and Tim Bradley. Pacquiao should have been able to stop Horn, Algieri, Mosley, Rios, Clottey, Vargas and Margarito. Those are guys that he could have stopped if he pushed harder for the KO. If Broner, 29, plays it safe against Pacquiao like he did against Shawn Porter and Mikey Garcia, then there’s very little chance that he’ll get knocked out. Mikey Garcia doesn’t think Pacquiao will be able to knockout Broner, because he sees him fighting to survive by holding a lot, not engaging and playing defense the way that a sparring would do. If Broner comes to try and win, then it’s a different story, but that’s not the fighter that the boxing public has seen from him in the last four years. Broner fought to survive against Marcos Maidana, Shawn Porter, Mikey Garcia and Jessie Vargas. That’s why Broner didn’t win those fights. Broner should be coming into the fight with Pacquiao with an 0-3 record in his last three fights. Broner was given a win over Adrian Granados three fights ago in 2017, but he lost that fight in the eyes of a lot of boxing fans. That was a fight in Broner’s hometown in front of a fan-friendly audience. “I think we will break him [Adrien Broner] down somewhat, but it will go a little bit later, but I would be surprised if he goes early though, because Manny wants this really badly,” Roach said. It’s going to be difficult for Pacquiao to KO Broner if his goal is to just survive the full 12 round fight. It would be bad for Broner to lose by a decision if he doesn’t come to fight, because the boxing fans will notice that he’s just trying to survive and not win. Roach has the right idea of planning on having Pacquiao throw a lot of punches at Broner to keep him bottled up for the entire fight. Broner will still get off his shots occasionally, but he won’t do it as much if Pacquiao is raining punches on him for three minutes of each round. Roach says he wants to make sure that Pacquiao is forcing Broner to fight the full three minutes of each round without letting him rest the way he wants and needs to for him to do well. One thing that concerns Roach is Broner’s right hand power shots. He’s going to be looking to hit the southpaw Pacquiao with his right hands the entire fight, knowing that he’ll have a good chance of landing those kinds of punches on him when he’s coming in. That’s the punch that Juan Manuel Marquez knocked Pacquiao out with in 2012. Marquez tagged Pacquiao right hand he was attacking in a straight line. Broner could do the same thing if he’s able to time Pacquiao well when he’s going on the attack each time.